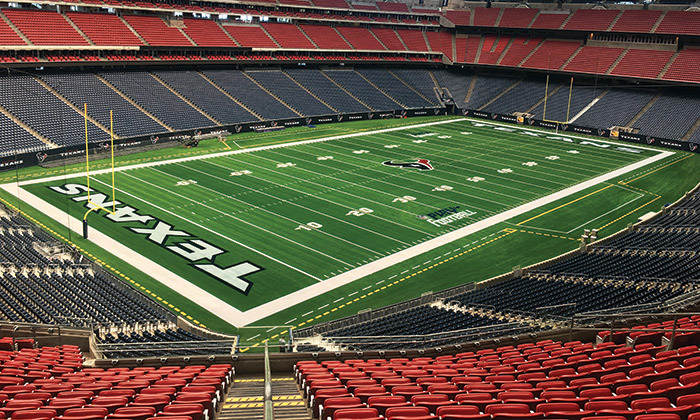 Austin, TX (Sep 15, 2017) – Hellas Construction was selected this year by Harris County Sports & Convention Corporation (HCSCC) to install a new Matrix® Turf field at NRG Stadium, home of the Houston Texans football team and the Houston Livestock Show and RodeoTM. The three-year deal gives the stadium a new synthetic turf field each year prior to the National Football League (NFL) Season. After the conclusion of each NFL Season, Hellas will donate the removed artificial turf to a non-profit organization chosen by a committee made up of representatives from HCSCC, SMG, the Texans, and Hellas. The committee will establish the criteria for awarding the donated turf, settling on a selected candidate around October 31st each year. The selected turf is Hellas’ Matrix® Turf with Helix Technology, which consists of twisted fibers of two different blade sizes and colors that bounces back quickly after use, enhancing playability and preventing “splash out” of the infill material. Hellas will manufacture and install 97,000 sq. ft. of synthetic turf for the Texans' NFL field. Because the turf field hosts a variety of games for colleges and high schools, the logos and end zones will be painted, so they can be easily changed for each game situation. NRG Stadium, is managed by SMG and owned by Harris County. NRG Stadium has been the home stadium of the Houston Texans since inception in 2002. The multi-purpose stadium holds about 72,000 people during sporting events and host over 500 special events and activities each year. The Texans are co-tenants of the stadium with the Houston Livestock Show and Rodeo.